Since April 2005, a new design range fulfills the contemporaneous Stelton products. “i:cons” is a personal accessories series that has something to offer for everyone who prefers exceptional functionality and design. With an innovative usage of forms, colours and materials, the designers create new paths for Stelton. With a light and slightly futuristic appearance the “i:cons”- line attracts the attention of a new generation. The series includes different products: a money clip, a cards holder, an USB memory stick, etc. It has consciously been renounced to use traditional dark, “business-like” looks for products of this kind, and one speaks now about an unconventional, but extremely practical appearance of a young, modern lifestyle. They are trend-setting accessories that one can use, as he desires. The new forms are modernly curved and have integrated innovative ideas into the exquisite design. “i:cons is occupied with the search after simple, innovative ideas for the everyday – not only after something new because of the will, what would be too complicated in the end” says Mauds Surel, the Stelton creative director. To keep it short: I:cons is there to simply be held. A simple example therefore is the slight swing in the cards case that holds credit or business cards without an additional closure. i:cons brings new colours into the Stelton selection and uses materials that one hasn’t used before. The products are made out of cream coloured fiber reinforced composites and stainless steel, whereby the band consists of a resistant silicone material. i:cons as well as the film “I, Robot”, where Stelton products are displayed, only have the futuristic appearance in common. This is the case, as i:cons talks about the enjoyment of doing something good to itself and to show simple design. The “I” however, refers to the “I” and the way of realizing itself enjoying great design. The owners of the i:cons are self-convinced and also especially stylish people. The useful products are naturally famous already, but they have never been created as seductive and refreshing like in the case of Stelton. The marketing campaign for the”i:cons” have been prepared in Berlin, the city of the icons. On the black-white pictures is where Steltons i:cons meet the politic and architectonic icons of Berlin. 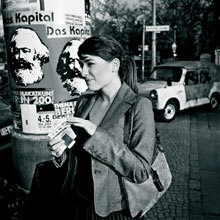 “i:cons” modern forms do thereby also meet history forms, freedom meets war, and a poster with the icons of Marx’s “Capital” are seen in the background of the marketing picture for the money clip.